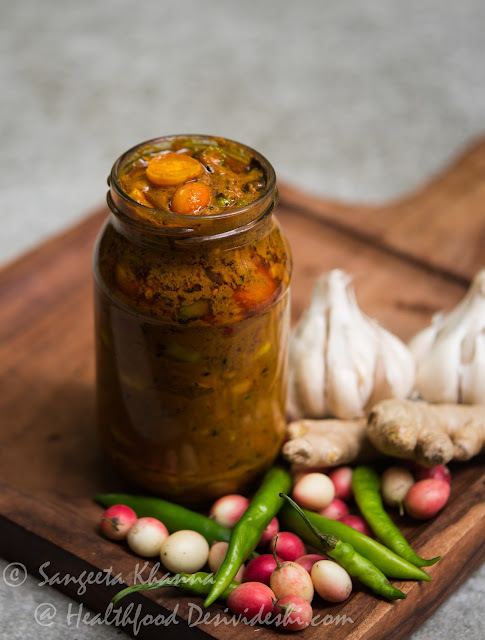 banaras ka khana: Karonde ka achar : Instant seasonal pickles.. 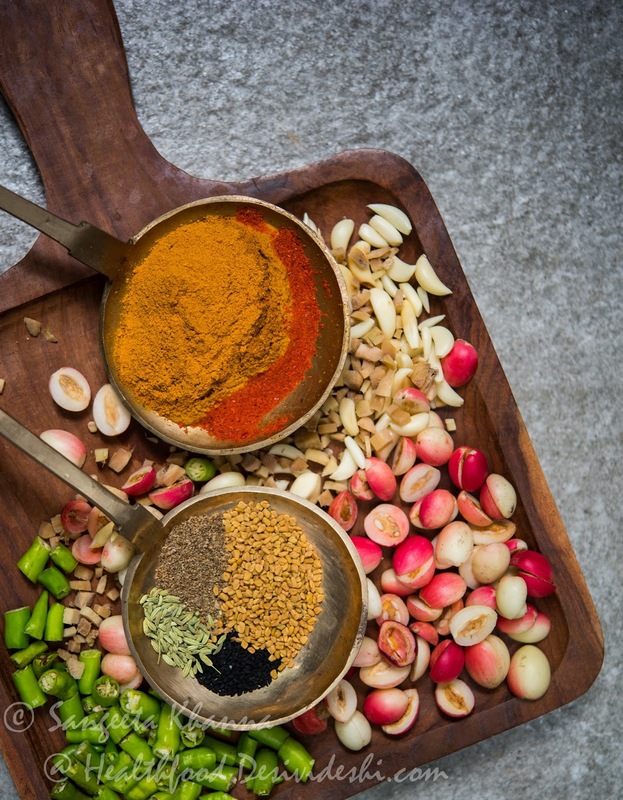 Some seasonal herbs and vegetables or fruits have their own charm. The way they taste in season is the best and that fresh flavor cannot be replicated when they are preserved for very long. 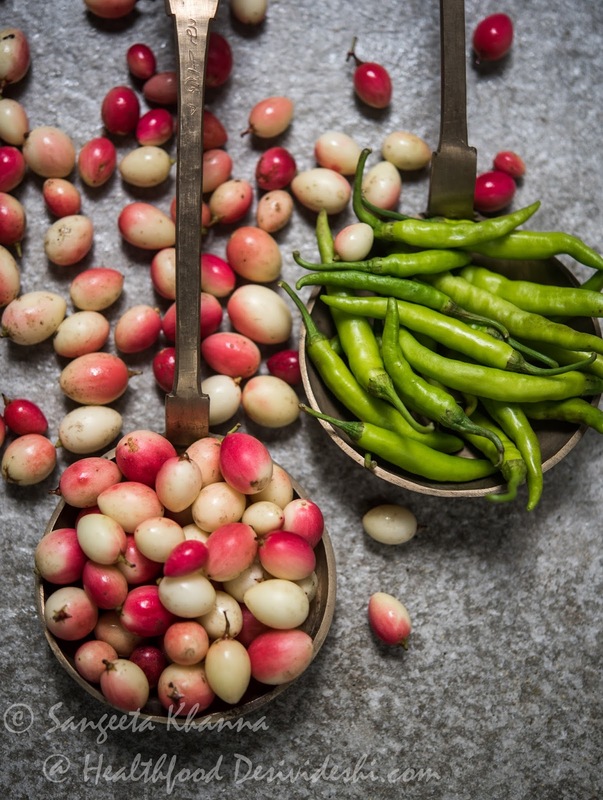 One such extremely tart fruit is Karonda (Natal plum or Carissa) that is in season right now. Karonde ka achar is something many of my friends can't resist. I made a yummy raw hot and sour Karonde ki chutney with it and a sweet n sour cooked one too. Then one day I was reminded of the achar my Daadi (grand mom) used to make. Those seasonal achars were made for a week or so and we all use to love them. These kind of pickles taste best when freshly made, they loose the flavors when preserved for long and taste just hot and sour. Best made into quick seasonal pickles. I just needed a small quantity as we both don't eat much achar, and a mere 100 gm of Karonda was good enough for 2 weeks and some for the maid too. It took only about 20 minutes to make this pickle that was ready to eat instantly. Loved it immediately for my lunch that day. The recipe is simple...you just need the following.. Mix the turmeric powder and red chilly powder in about 1/4 cup of water, keep aside. Heat the oil in a pan and tip in the Nigella seeds. Wait till the Nigella seeds get aromatic, followed by the hing and the other seeds. Now switch off the gas and slowly pour the turmeric and chilly powder solution into the hot oil. This is just to prevent burns as the water would splash up when poured into very hot oil. Turn on the gas and cook the mixture till the oil comes on top and it becomes almost like a thin slurry. Add salt. Now add the chopped bits of everything and stir well. Cook till the oil starts bubbling again around the edges and the mixtures looks glazed. Shiny almost. You don't have to cook it completely, just for 3-4 minutes on medium flame. It should look like this picture in your pan finally. Take off heat and let it cool a bit. Sprinkle mustard powder on it and mix well.Empty the contents in a glass jar and refrigerate for about 2 weeks. Goes very well with all kinds of Indian food. I like to mix it in some salads as well, like a chopped mix of cucumbers, red onions and fresh coriander greens gets perked up by this pickle. You can make pickles with any seasonal vegetables the same way. Just parboil or blanch some florets of cauliflowers, some diced carrots and even green peas and mix with garlic and ginger etc as per your choice and proceed to cook them the same way as this. 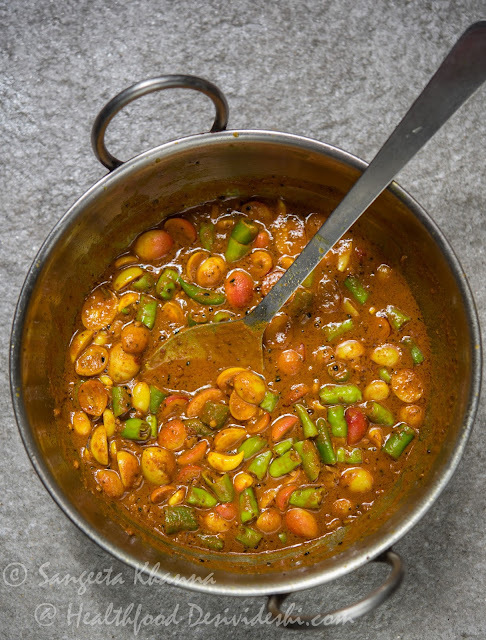 A seasonal gobi-gajar-matar ka achar is ready. For tartness you can add thin slices of lime to the cooking mixture or some lime juice after the mixture gets cooked and cooled. This way you can enjoy Indian pickles even if you don't make them in big batches in season of raw mangoes or lemons. Turnips, Beets, all varieties of Peppers and Bell peppers, all varieties of Beans and even Yams can be pickled the same way. What vegetable are you going to pickle now? 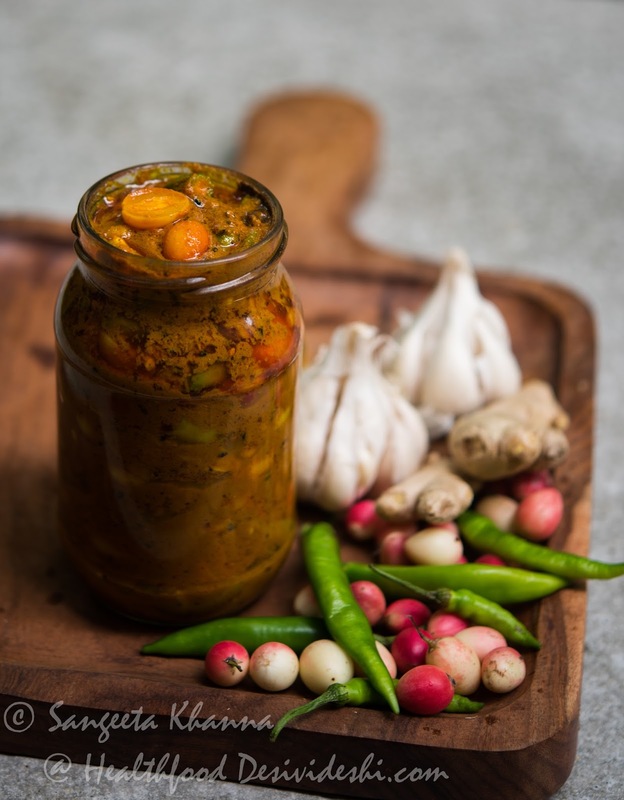 Karonde ka achar is great for the season right now. This is my kind of stuff. Everytime I see karonds I wonder what to do with it. This is YUM!! Do you use 1tbsp mustard oil or powder? It is 1 tbsp mustard oil and 2 tbsp yellow mustard powder. Wow.. yummy pickles... this is something I am going to try.Our country has so many such variations in pickle making. Thanks for sharing this recipe. The recipe looks great...i 'm going to try it but...What is chilly and turmeric solution made in? Water?